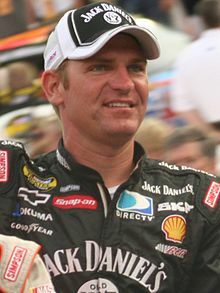 Clinton Edward "Clint" Bowyer (born May 30, 1979) is an American professional stock car racing driver. He currently competes full-time in the Monster Energy NASCAR Cup Series, driving the No. 14 Ford Mustang for Stewart-Haas Racing. Prior to driving for Stewart-Haas Racing, he drove for HScott Motorsports for one year, Michael Waltrip Racing for four years, and Richard Childress Racing for eight years. Bowyer won the 2008 Nationwide Series championship driving for RCR. Bowyer began racing at the age of five in motocross. He went on to capture over 200 wins and numerous championships over the next eight years. In 1996, he began racing street stocks at Thunderhill Speedway in Mayetta, Kansas, and won the Modified championship there in 2000. Bowyer racked up 18 wins and 32 top-five finishes on his way to capturing the 2001 Modified championships at Lakeside Speedway in Kansas City, Kansas and Heartland Park Topeka. In 2002, he began racing in the NASCAR Weekly Racing Series, posting 9 poles, 12 wins and 32 top-five finishes en route to a second-place finish in the NASCAR Weekly Racing Series national point standings. He was also crowned the 2002 NASCAR Weekly Racing Series Midwest Champion after another Modified championship at Lakeside Speedway and a Late Model championship at the famed I-70 Speedway in Odessa, MO, his first attempt at racing on asphalt. In 2003, Bowyer raced a full season in the NASCAR AutoZone Elite Division Midwest Series, scoring one top-ten finish in 11 starts. He also would make his first ARCA starts in 2003, and caught the eye of legendary car owner Richard Childress after leading 47 laps and finishing second in his debut at Nashville Superspeedway driving for Scott Traylor out of Kansas City. After the second-place finish, Childress called Bowyer by phone and offered him a job. Bowyer thought he was joking and hung up on him. Childress called back soon afterward and with a not-too-happy tone he still offered the job to Bowyer. In 2004, Bowyer began by finishing 8th in the ARCA Re/Max Series race at Daytona in the No. 7 Chevrolet for Gerhart. In 2004 Bowyer began running in the Busch Series for Childress, sharing seat time in the No. 21 Chevrolet with Kevin Harvick. He drove in half of the 34 Busch Series races that year, winning one pole and seven top-tens, attaining a season-high 3rd-place finish in the Federated Auto Parts 300 at Nashville Superspeedway in June. He also ran three races for Kevin Harvick Incorporated with help from Andy Petree Racing. Bowyer made two starts for Bill McAnally Racing in the Camping World West Series in the No. 20 Chevrolet. In his two starts at Phoenix and Auto Club Speedway, he won 1 pole and had a best finish of 2nd. Bowyer's first full Busch season was in 2005, replacing Ron Hornaday in the No. 2 Chevrolet. He won two poles and two races en route to a second-place finish to repeat-champion Martin Truex Jr., losing by only 68 points. He also made his Nextel Cup debut in the No. 33 Chevy on April 23, 2005, during the Subway Fresh 500 at Phoenix International Raceway. He finished 22nd as the first car one lap down. Richard Childress Racing announced on October 15, 2005, that Bowyer would race the No. 07 Chevrolet full-time in the Nextel Cup series, replacing Dave Blaney for the 2006 season. Bowyer began his rookie Cup season with three Top 5 finishes and had a total of eleven Top 10s that season, with his best finish being a 3rd at California Speedway. He finished 68 points behind Denny Hamlin for NASCAR Rookie of the Year honors. Bowyer also continued to drive the No. 2 in the Busch Series full-time, winning once and finishing 3rd in points. Bowyer won his first Craftsman Truck Series race in the No. 46 Chevrolet Silverado fielded by Morgan-Dollar Motorsports at Texas Motor Speedway on November 3, 2006, in his third career Truck start, making his first CTS start that year at Martinsville for Green Light Racing. After starting the 2007 season with a last-lap crash at Daytona (crossing the finish line upside down and on fire as teammate Kevin Harvick won), Bowyer won the Budweiser Pole position for the Dodge Avenger 500 at Darlington Raceway. He finished the regular season 9th in points, but was seeded 12th for the playoff since race wins determine playoff seeding. Bowyer won his second pole at the Sylvania 300 at Loudon, and two days later went on to win his first Nextel Cup race in his 64th start. The win made Bowyer the fifteenth driver to win at least one race in all three of NASCAR's top series. For the 2007 Busch season, Bowyer ran a partial Busch Series schedule in the RCR No. 2 car. On April 20, 2007, he won the Busch Series Bashas' Supermarkets 200 at Phoenix International Raceway. He followed that up with another Busch Series win on May 4 in the Circuit City 250 at Richmond International Raceway. Bowyer also ran select races in the NASCAR Craftsman Truck Series for Kevin Harvick. In 2008, Bowyer continued to drive in the Cup and Nationwide Series full-time. Bowyer dominated the late stages of the Daytona 500 but was spun out by Juan Pablo Montoya with 17 laps remaining. On May 3, 2008, Bowyer earned his second Sprint Cup victory, winning the Crown Royal Presents the Dan Lowry 400 at Richmond International Speedway. Bowyer led only two laps, going to the front after Dale Earnhardt Jr. and Kyle Busch got together with less than four laps remaining in the race. On August 23, 2008, Bowyer was announced as the driver of the No. 33 Chevrolet Impala SS for RCR. 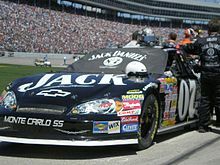 Casey Mears from Hendrick Motorsports replaced Bowyer in the Jack Daniel's-sponsored car. This move was necessitated by a sponsor's request, as General Mills did not want Mears, who had been driving in the 2008 season for rival cereal maker Kellogg's, representing them, so Childress sponsors General Mills and Brown-Forman Corporation (parent company to Jack Daniel's) agreed to the swap so Bowyer, who drove for Brown-Forman, would drive for General Mills, and Mears could drive for Brown-Forman, as they had no problems with Mears representing the company. At Bristol, Bowyer had one of his last races in the No. 07 Chevy. He had a memorable event when he barely avoided an accident which was started by Michael Waltrip. When Bowyer drove on from the crash, he angrily radioed "Michael Waltrip is the worst driver in NASCAR period! I can't believe NAPA would sign him back on!" When Bowyer later joined Waltrip's team one of the conditions to joining was for Bowyer to take back these words. On November 15, 2008, Bowyer won the NASCAR Nationwide Series Championship at Homestead-Miami Speedway with a narrow margin of victory over Carl Edwards of 21 points. Edwards won the race with Bowyer finishing 5th. Bowyer concentrated primarily on the Sprint Cup Series in 2009 and drove the No. 33 Chevrolet Impala to 15th place in the season standings. Bowyer trimmed his participation in the Nationwide series to 12 races but performed well, winning at Daytona (July 3) and Dover (September 26), finishing in the Top 5 in 6 of the 12 races and notching 8 Top 10s. Bowyer started the Cup season in strong fashion, finishing 4th in the Daytona 500 and 2nd at Las Vegas in the 3rd race of the year. With a 6th in Atlanta and a 5th in Martinsville, Bowyer was 2nd in the overall standings after 6 races. A tough stretch in races 7 through 12 dropped Bowyer down to 17th overall, 109 points behind Mark Martin in 12th place. After a much more consistent run in races 13- 23 (3rd at Pocono in the No. 33 Hartford Racing paint out, 8th at Sonoma, 8th at Michigan), Clint had climbed up to 14th overall, within 58 points of 12th place. Finishing in the top 15 in 8 of 11 races helped him make up 51 points on the 12th-place position. A 21st finish the following week (race 24) at Bristol really hurt Bowyer's chance at the Chase, dropping him 112 points behind Matt Kenseth in 12th with just 2 races prior to the Chase. It was the 25th race (Pep Boys 500 at Atlanta) that sealed Bowyer's fate, as a spin on lap 309 cost him 2 laps and the chance to compete in the Chase. While his chances at the Chase were over, Bowyer finished the season as he started it, with 5 Top 10s and 9 Top 15s in the last 11 races. His top finish was the 6th-place run at Charlotte in the Scary Fast Count Chocula paint out. Overall, Bowyer finished the 2009 Sprint Cup Series in 15th place. In 2010, Bowyer drove the No. 33 Chevrolet Impala. True to form, Bowyer, performed well early in 2010, finishing 4th in Daytona, 7th at Martinsville, and 9th at Phoenix to stand 6th after 7 races. However, at Texas in the Samsung Mobile 500 (race 8), Bowyer got caught in a major crash on lap 317 that wiped out 8 other drivers and caused a 19-minute red flag race stoppage. The resulting 36th-place finish dropped Bowyer to 14th position overall, only 1 point behind 12th place Joey Logano. 7th- and 12th-place finishes at Talladega and Richmond put Bowyer back into 12th place after 10 races. The 11th race run at Darlington promised to be special. Bowyer ran the new The Hartford Racing paint out as part of The Hartford's 200th anniversary celebration. As part of Fox's coverage, Bowyer was one of 4 cars with an in-car camera for the race. However, 101 laps into the race, Bowyer went to the pits and ultimately the garage, with brake issues. After a 2nd long stop to correct, Bowyer finished in 32nd position, 36 laps down. Bowyer ran well again in races 12 through 14, like 17th, 7th, and 9th-place finishes allowed him to move back up into 12th-place overall. In race 13 (Coca-Cola 600 at Charlotte), Bowyer led lap 217 following a caution for debris. Kurt Busch passed Bowyer on the following lap and went on to win the race. In races 15-17, Bowyer finished 22nd at Michigan, 31st at Sonoma, and 7th at Loudon, NH. Despite the poor finish, Bowyer was very competitive at Sonoma. He led lap 80 (of 110) and was in 7th place with 11 laps to go. But on lap 100, Elliott Sadler got bumped by Jeff Gordon and spun Bowyer, dropping him all the way back to 34th place. Bowyer had one of his strongest runs of the year in the Coke Zero 400 at Daytona, leading 17 of the final 21 laps. Unfortunately on the final Green-White restart, Bowyer got split by Jeff Gordon, lost the lead, fell back in the pack and ultimately spun. In finishing 17th, Bowyer fell 49 points behind 12th place Carl Edwards. In race 19 at Chicagoland, Bowyer ran well all night, finishing 4th and moving up into 12th place in the overall standings. He started 15th but moved up quickly, running in the Top 10 for the first half and then in the Top 5 for most of the latter half of the race, battling Jeff Gordon for the lead with less than 40 laps to go. In the Sylvania 300 at New Hampshire Motor Speedway, Bowyer started 2nd and led the most laps before fading back into the Top 5. Taking the white flag in the second position, he suddenly witnessed then-leader Tony Stewart run out of fuel, giving Bowyer the 3rd win of his Sprint Cup career and vaulting him to 2nd in the Chase standings behind Denny Hamlin. However, this was negated during post-race inspection at NASCAR's R&D center. Reports surfaced that Bowyer's car used at Richmond had come close to failing inspection. NASCAR announced on September 22 that they had issued fines and penalties to the No. 33 team after failing a secondary inspection. Most critically, crew chief Shane Wilson was suspended for the next 6 races and both Bowyer and car owner Richard Childress face $150,000 in fines and the loss of 150 championship points. The penalty dropped Bowyer back to 12th in points, 185 points behind Denny Hamlin. Childress appealed the decision, which reduced the suspensions to four races and $100,000, but the 150-point deduction was upheld. During the Pepsi Max 400 weekend at Fontana, Bowyer and fellow Childress driver Austin Dillon taped an episode of The Price Is Right that was scheduled to feature NASCAR-themed Showcases (a practice that occurs during a Fontana race; host Drew Carey was the Grand Marshal of the August 2008 race) and aired on November 15. Bowyer barely edged teammate Kevin Harvick for the victory in the fall Talladega race, the AMP Energy Juice 500. The race ended with the leaders in Turn 1 when a caution was displayed for a large wreck on the front straightaway on the final lap. Bowyer finished 10th in the final Chase standings, earning him a spot on stage at the season-ending Awards Banquet. Bowyer started off the 2011 season strong in the Budweiser shootout practice sessions, and he and his teammates regularly sat on top of the pylon. In the race, he and Jeff Burton led many laps but faded to 10th at the end (9th due to Denny Hamlin being penalized for going below the yellow line). Bowyer qualified 5th for the Daytona 500 and finished 2nd to teammate Jeff Burton in the second Gatorade duel by 0.005 seconds. They together dominated that race. In the Daytona 500, Bowyer teamed up with many drivers throughout the day including Jeff Burton; Paul Menard (his new RCR teammate); Dale Earnhardt Jr.; and Kyle Busch. After Burton's engine let go, Bowyer found himself getting a push from Kyle Busch. With four laps to go, Kurt Busch got into the back of Regan Smith which turned him up in front of Bowyer. Ryan Newman was also involved. Bowyer was able to salvage a 17th-place finish out of it, mainly because of the big pileups earlier in the race. He had led 31 laps. The next race at Phoenix, Bowyer was taken out early in a multi-car crash on the backstretch. The Helping Hands (his pit crew) were able to repair the car fairly quickly and he was able to finish 27th. In the 2011 Aaron's 499 at Talladega, Bowyer led the most laps with 38 and was being pushed by Kevin Harvick on the last lap, dueling with Hendrick drivers Jeff Gordon and Mark Martin. Approaching the tri-oval, Jimmie Johnson and Dale Earnhardt Jr. squeezed to the far inside, and Johnson beat Bowyer to the line by 0.002 seconds (less than a foot) in a four-wide finish, tied with the finish of Ricky Craven over Kurt Busch in the 2003 Carolina Dodge Dealers 400 for closest finish in Sprint Cup history. At Dover, in the Nationwide series, Bowyer was involved in a major crash on the last lap, with Bowyer going on his side. He, and no-one else were injured. At New Hampshire, Bowyer led 49 of the last 51 laps and seemed to be on the road to victory; but with two laps to go, in a bizarre twist of fate, Tony Stewart passed him to win in a role reversal from the 2010 race. On October 7, Bowyer signed a 3-year contract to race the No. 15 Toyota for Michael Waltrip Racing, starting in 2012. Bowyer did not make the Chase, but he won the Chase race at Talladega for the 2nd consecutive year, pulling a slingshot on Burton out of turn 4 on the final lap of the race. The margin of victory was 0.018 seconds. It was his last win with Richard Childress Racing. The 2012 season marked a new beginning for Bowyer as he moved from Richard Childress Racing to Michael Waltrip Racing, signing a 3-year deal. Improvements at Michael Waltrip Racing with the addition of former RCR director of competition Scott Miller and veteran driver Mark Martin as a teammate translated into Bowyer's best season statistically in the Sprint Cup Series. Bowyer's 2012 season began sour, as his Daytona 500 qualifying time was disallowed, and he also ran out of fuel under green when he missed pit road during the 500. In March, he ended up starting a year-long rivalry with Jeff Gordon because, at the Martinsville race, Gordon's team Hendrick Motorsports tried to win their 200th victory at the team's favorite track to honor the deceased John Hendrick but Bowyer in the final laps tried to pass for the win but in the process made contact with Gordon and Jimmie Johnson, with all three spinning around and costing the win to Ryan Newman. Bowyer apologized for the contact but later contacts at future 2012 races led to a heated rivalry. In June, at the Toyota/Save Mart 350 in Sonoma, Bowyer dominated the race, scoring his first road course and MWR win by holding off Tony Stewart and Kurt Busch. At the AdvoCare 500 at Atlanta, Bowyer clinched a Chase berth while suffering battery issues with his car. He rebounded the following week at the Federated Auto Parts 400 at Richmond, winning the race using fuel strategy despite being spun by Juan Pablo Montoya mid-race. Bowyer's two wins positioned him sixth at the start of the Chase for the Sprint Cup. In the Chase, he won at Charlotte after Brad Keselowski was lapped for a late-race fuel stop on pit road. During the next-to-final lap at the AdvoCare 500 (Phoenix) on November 11, 2012, Bowyer was yet again involved in an accident with Jeff Gordon, who he had several unseen incidents with at past races; in which Bowyer accidentally forced him to hit the wall. Jeff Gordon was black-flagged for a failed attempt to cut Bowyer's tire and in reply to the black-flag Gordon retaliated by intentionally crashing Bowyer into the wall collecting Joey Logano and Aric Almirola. After Gordon's car was parked behind his team's hauler, a member of Bowyer's team shoved Gordon from behind and both teams scuffled. After Bowyer entered the pit area with his damaged car and noticed his team was not in his pit stall, he sprinted towards Gordon's hauler attempting to enter it before being restrained by a single NASCAR official. The incident mathematically ended Bowyer's chance of winning the Championship and despite his second-place finish the next week it was determined that he would have lost regardless if he won at Homestead after Phoenix. Bowyer was not penalized for his involvement in the fight but his crew chief Brian Pattie was fined $35,000 after he expressed his displeasure with Gordon by saying profanity publicly on the television forcing ESPN to have to apologize to viewers. However, the following week, Bowyer rebounded, and finished second at Homestead, ironically behind Gordon, and completed the series with a career best second-place finish in the final points, passing Jimmie Johnson by one point, who was eliminated for a drive train malfunction. In victory lane at the race, Jeff Gordon apologized for his behavior at Phoenix and moved on with Bowyer from the incident. Bowyer started out 2013 by participating the Rolex 24 Hours of Daytona, driving a Ferrari 458 with AF Corse/Michael Waltrip Racing. The team finished 16th overall and 7th in class. At Richmond International Raceway on September 7, Bowyer became the subject of controversy as, late in the race, his No. 15 Toyota spun; accusations were made that the spin was intentional, as part of an effort by MWR to ensure that Martin Truex Jr. qualified for the Chase for the Sprint Cup. NASCAR president Mike Helton stated the following morning that scoring officials on the scene did not believe the spin was intentional, but that NASCAR was reviewing the incident. The following Monday evening, NASCAR docked all three MWR teams, including Bowyer, 50 driver/owner points. MWR was also fined $300,000. Despite the large penalty, Bowyer retained enough points to remain in the Chase. He had already clinched a spot in the Chase at the Irwin Tools Night Race. Bowyer did not participate in the Sprint Unlimited as he did not win a pole during the 2013 season. His season started on a wild note when Bowyer was involved in a last lap crash of race 2 in the Budweiser Duels, with Bowyer's car being sent airborne and performing a barrel roll before landing on its wheels. At Darlington, Bowyer was the center of controversy when he got some contact with Kurt Busch. While racing Busch for a top-ten spot, Bowyer drove into the back of Kurt Busch who spun out and wrecked. Busch replied by waving his hands in frustration at Bowyer under yellow. In a post-race interview, Bowyer apologized, stating "You never want to wreck anybody. It was quite clear I got into the back of him and wrecked him." Two weeks later at Richmond, Bowyer tried to move to the lead on lap 1 but tapped pole-sitter Kyle Larson which forced Larson to drive from 43rd for a recovery. Later his car caught fire on pit road during a pit-stop. After an Atlanta engine blowup, Bowyer's hopes to make the Chase by consistency were dashed and the next week Bowyer missed the Chase by a slim 3 points. In the Texas Nationwide race, Bowyer replaced Elliott Sadler on lap seven due to a stomach illness, Bowyer qualified for Sadler for the race. Bowyer started off the season with a top 10 at Daytona. Despite having a few top tens throughout the year, on August 19 it was announced that Bowyer & MWR will part ways after the season ends, with MWR not fielding full-time teams in 2016. On September 30, 2015, it was announced that Tony Stewart (Stewart-Haas Racing) would retire from the NASCAR Sprint Cup series after the 2016 season and negotiated a contract which will allow Bowyer to drive the No. 14 car in the 2017 season. On October 2, 2015, it was announced that Bowyer will move to HScott Motorsports for the 2016 season replacing Justin Allgaier before making his transition to Stewart-Haas Racing the following season. On December 15, 2015, a leaked photo on Twitter showed that Bowyer will bring over his No. 15 & 5-Hour-Energy sponsorship from Michael Waltrip Racing to HScott Motorsports for his lone season with them. Bowyer made the Chase due to having enough points to qualify, but his Chase was hit heavily by a 25 driver and owner points penalty, a $75,000 fine and the suspension of crew chief Billy Scott for 3 races. Bowyer appealed the penalties but they were upheld by the appeals panel. With the penalty, Bowyer didn't advance to the second round of the Chase. In his last season with MWR, Bowyer was winless, and scored just 12 top 10s and finished 16th in the championship. Bowyer returned to the Nationwide Series, now known as the Xfinity Series, at Chicagoland, driving the No. 88 for JR Motorsports. He ended up starting the race in 7th and finishing the race in 6th. With Tony Stewart's retirement, Bowyer moved from the No. 15 HSM Chevy to the No. 14 Stewart-Haas Racing Ford Fusion. Bowyer started the season with a 2nd-place finish on the 2nd Can-Am Duel. Bowyer got his first top ten at Las Vegas with a 10th-place finish. Bowyer had a significantly better race at Auto Club, finishing third and a 2nd-place at Bristol several races later. After no top fives 7 races later he finished second at Sonoma behind teammate Kevin Harvick giving Stewart-Haas Racing its 2nd ever 1-2 finish for the first time since 2011. Bowyer finished second yet again at the Coke Zero 400 at Daytona the following week. Deja vu happened as a mechanical issue in the Southern 500 at Darlington put Bowyer in a must-win situation at Richmond (just like in 2014) to make the Playoffs. He finished 24th after contact with Matt Kenseth when Kenseth avoided an ambulance at the entry of pit road while under caution. Bowyer got off to a strong start in 2018, posting Top 15 finishes in four of the first five events, including a third-place finish at the Atlanta race. On March 26, he broke a 190-race winless streak with a victory at the spring Martinsville race, which gave him his first Playoff run since 2015. Bowyer then scored his second win of the season at the rain-shortened June Michigan race. Despite bad finishes at Las Vegas and Dover, he has stayed consistent in the Playoffs, advancing to the Round of 8 before a crash at Phoenix eliminated him from the Playoffs. Bowyer finished the season 12th in points. Bowyer started his own Dirt Late Model team, Clint Bowyer Racing in 2008. Well-established veteran Shannon Babb of Mowequa, IL was behind the wheel of Clint's Rocket Chassis, and had a very solid season. Babb left to form his own team at the end of 2008, due to wanting to run more of an "outlaw" type schedule, and wanting to race closer to home to be with his family. For the 2009 season, the 2005 World 100 Champion Dale McDowell (who ironically inherited the win via Babb being light at the scales) took over the seat, and the number was changed to Dale's signature No. 17M, Jared Landers also drives for the team in the No. 5 late model. The team elected to run the Lucas Oil Late Model Dirt Series full-time in 2009, choosing to run Warrior Racecars, with help from Warrior's owner, Sanford Goddard. Winning two races and finishing fourth in the points standings, it was a decent season. Since then, the 17M has become a staple of the Lucas Oil Series, continuing on the 2010 tour. Clint Bowyer Racing also has fielded cars in Tony Stewart's Prelude to the Dream in 2008 (Bowyer, 2nd and Jimmie Johnson, 10th) and 2010 (Johnson won, Bowyer 2nd). Both years these were also Warrior Racecars. Clint Bowyer Racing fielded a car for Clint in 2011 for the UNOH DIRTcar Nationals. A victory in a feature night race helped Clint secure the overall modified championship in the event. In 2014 Clint Bowyer Racing won its first Lucas Oil Dirt Late Model Championship with Don O'Neal driving the No. 5 Peak Performance car. In April 2014, Bowyer married Lorra. Weeks after their marriage they announced that they were expecting their first child together, a boy. On October 1, 2014, their son Cash Aaron Bowyer was born. On June 15, 2016, it was announced that Bowyer and his wife are expecting their 2nd child. On December 9, 2016, his wife Lorra gave birth to a healthy baby girl named Presley Elizabeth. On May 6, 2008, Clint Bowyer attended and hosted the first annual Clint Bowyer Charity Golf Event in his hometown of Emporia, Kansas. It raised $160,000 for the Emporia Community foundation to "make Emporia a better place. While Bowyer was in Emporia for one of his golf tournaments for charity, he had the idea to raise money for and build a community center. Bowyer dedicated the building on March 12, 2012. Bowyer says he envisions the building can be used for anything for business meetings to weddings to concerts and was constructed with flexibility in mind. The new Bowyer Community Building is located at the Lyon County fairgrounds, which is on Highway 50 in Emporia. Bowyer made a guest appearance on an episode of A&E's Duck Dynasty in 2012 on an episode titled "Drag Me To Glory". Bowyer was featured in the episode using his customized camouflage limousine in a race with the shows star, Willie Robertson, who was using a similar limousine. In 2015, he co-hosted an episode of Diners, Drive-ins and Dives with Guy Fieri where they went around Charlotte to find the best food spots. In June 2017, Bowyer was a color commentator for the Fox NASCAR broadcast of the Xfinity race at Pocono. Part of a Cup drivers-only coverage, he worked alongside Kevin Harvick and Joey Logano in the broadcast booth. ^ Dermody, K.C. (September 6, 2011). "NASCAR: Focus on Clint Bowyer's Sprint Cup Career". Yahoo! Sports. Retrieved 2013-03-12. ^ "Childress: Fourth car adds promise; more to come". ESPN.com. 23 August 2008. Retrieved 14 July 2018. ^ "Standings – Nascar.com". Retrieved 14 July 2018. ^ "Jayski's NASCAR Silly Season Site - Sprint Cup Paint Scheme Gallery, News, Links, Chart". www.jayski.com. Retrieved 14 July 2018. ^ "Stopping is not reasonable speed to NASCAR; Several drivers leave Sonoma angry". Retrieved 14 July 2018. ^ "Associated Press News". AP News. Retrieved 14 July 2018. ^ Sporting News Wire Service (2010-09-20). "Bowyer snaps 88-race drought in Chase opener – Sep 20, 2010". Nascar.Com. Retrieved 2012-11-14. ^ "Keselowski leads cup chase after brawl-filled phoenix race". November 11, 2012. ^ Livingstone, Seth (2012-12-17). "2012 is the best Bowyer has ever had". NASCAR. Retrieved 2012-12-24. ^ Gluck, Jeff (September 8, 2013). "Conspiracy spin by Clint Bowyer?". USA Today. McLean, VA. Retrieved 2013-09-08. ^ "NASCAR investigating Bowyer spin". Fox Sports. September 8, 2013. Retrieved 2013-09-08. ^ Caraviello, David (September 9, 2013). "Truex out of Chase, Newman in after penalties". NASCAR.com. Charlotte, NC. Retrieved 2013-09-16. ^ Glendenning, Mark (2014-02-21). "Daytona 500: Denny Hamlin wins Duel two amid huge last-lap crash". Autosport. Retrieved 2014-02-21. ^ Pockrass, Bob (April 25, 2014). "Clint Bowyer apologizes to Kurt Busch for Darlington wreck". Sporting News. Retrieved 2014-04-27. ^ Albert, Zack (April 26, 2014). "Bowyer's night goes up in smoke". NASCAR.com. Retrieved 2014-04-29. ^ Winkler, George (2014-11-01). "Clint Bowyer subs for sick Elliott Sadler". Yahoo! Sports. Archived from the original on 2014-11-02. Retrieved 2014-11-01. ^ "MWR grants Bowyer release as team on verge of collapse". USA Today. Retrieved August 19, 2015. ^ "Clint Bowyer Joining JR Motorsports for NXS Race at Chicagoland". JR Motorsports. May 5, 2016. Retrieved May 5, 2016. ^ "Clint Bowyer Racing Names Driver for Newly Formed Dirt Late Model Team". The Autochannel. January 9, 2008. Retrieved August 1, 2015. ^ "Shannon Babb Racing Joins Forces with Sheltra Motorsports in 2009". The Autochannel. December 20, 2008. Retrieved August 1, 2015. ^ "OMG, Clint Bowyer is a father". Sporting News. October 1, 2014. Retrieved August 1, 2015. ^ Watch the Drag Me To Glory Full Episode - Duck Dynasty - A&E Archived 2013-02-23 at the Wayback Machine. Aetv.com (2012-11-29). Retrieved on 2014-04-12. ^ Starer, Taylor (March 10, 2015). "BOWYER, FIERI TEAM UP FOR 'DINERS, DRIVE-INS AND DIVES'". NASCAR. Retrieved April 26, 2017. ^ Perez, A.J. ; Hembree, Mike (May 19, 2017). "NASCAR drivers will handle broadcast duties during Xfinity race at Pocono". USA Today. Retrieved June 7, 2017.